Today the Mets recalled Fernando Nieve from AAA Buffalo to take the place of JJ Putz who finally stopped pretending there wasn’t something wrong with his arm. Nieve has reportedly been assigned No. 38. Nieve wore No. 50 in spring training, but that number went to Sean Green once Green decided he was unworthy of comparisons to Aaron Heilman(how right he was) and swapped in No. 48. Not to say I told you so but we smelled trouble long before this Putz-Green-Heilman deal ever got done inasmuch as “addition by subtraction” is a concept that works great in opinion columns and talk radio but rarely on the baseball field. I’m not saying that time hadn’t come to swap away Heilman (not to mention Endy Chavez, Joe Smith, Jason Vargas, Makiel Cleto,and Mike Carp) but seeing as we’re looking at a $9 million fat guy having elbow surgery, a righty specialist who’s already lost his job, and a reserve outfielder, this whole deal is looking pretty much like “subtraction by subtraction” so far. Nieve by the way will be the third Fernando in uniform for the Mets, which has to be some kind of record. The Mets are expected within the hour to announce their part in a three-team, multiplayer swap meet that will make former Mariners JJ Putz, Sean Green and Jeremy Reed Mets. If I have this scored right, Aaron Heilman, Endy Chavez and prospect Mike Carp are en route to Seattle and Joe Smith is off to Cleveland, which is collecting various other jetsam from Emerald City. The prize in this deal is Putz, who presumably takes over Heilman’s role in the 8th inning and hopefully doesn’t inherit his demeanor: You know he’s every bit the closer Francisco Rodriguez is. Green is tall right-handed reliever, who’s death on righties, clobbered by lefties and a ground-ball machine a la the departed Bazooka Joe; and Reed, like Chavez when he arrived back in New York, is a faltering one-time leadoff prospect with a noodle bat but good defensive skills. So with the roles aligned, seems it’s only a matter of having parted with Carp. ( Edited to add, also Jason Vargas and about 50 more low-level prospects too I see now, not sure where they’re off to). As for the impact on jersey numbers, 48, 35 and 10 are set free. Putz wears No. 20, which is available if coach Howard Johnson gives the OK (he will); Green wore54 (he’ll be dressed in something lower, let’s say 35) and Reed wore 8(uncomfortably unissued now for 8 years). Put Reed in 10, Johnson in 54 and we’ll have ourselves a multiplayer uni-swap as well. Thanks to all the contributors who kept up to date round the clock on the Rodriguez Jersey Watch — he’s apparently gone with 75 as suspected. A Met first. No they didn’t make it to 11 straight wins but as first pointed out in the comments section below the Mets on Friday ran out an all-odd starting lineup for what we believe to be the first time in their 46-year history. They’d been toying with this accomplishment frequently this season, particularly with Alou unavailable, and were heretofore held back mainly by the presence of Endy Chavez in the starting 9 (or starts by Pelfrey or Perez). Fittingly, this milestone — rarer even than an extra-base hit by Brian Schneider — was achieved only after replacing even manager Willie Randolph with an odd successor in Jerry Manuel. And with that taken care of, we can focus on regaining first place. Oddly enough (get it?!) the right fielder in both lineups provides the only even number. It’s entirely possible I overlooked an odder starting nine at some point this year — the current personnel leave almost no chance for an even starting squad, but as always if you happen find occurrances such as this — also, all-ascending or all-descending lineups, so rare I’ve found none in 46 years — you know where to send it. Gary Cohen may be aware of the two-sixes controversy, but it’s not like Big Media is on this story yet. Roster move: Tony Armas to the disabled list, Carlos Muniz back up again. 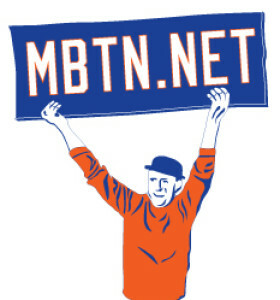 We also found a cool new blog: Getting Paid to Watch, by 1986 Met trainer Bob Sykes,who combines unique perspective on the 1986 Mets along with good writing.